Meeting of the Seeds: a round bale discussion, dinner, and seed swap, July 2011. For long-time readers of the Kindle blog, you may remember our obsession with seeds last winter, when we covered a wide range of seed related issues and grantee projects over the course of several months. Our passion and commitment to this topic has not waned. With news of seed revolutions great and small making international headlines over the past weeks, it is timely that we share with you an incredible series of interviews and perspectives from Seed Broadcast co-founders, Jeanette Hart-Mann and Chrissie Orr. Seed Broadcast caught our attention because they were addressing the persistent problem of seed and food sovereignty in a unique and creative way. Their mandate is to explore grassroots seed actions and practices through dialogues, storytelling, story-sharing, knowledge collection and distribution. Through their website, workshops and highly innovative Mobile Seed Story Broadcasting Station, they are paving the way for people all over the country to contribute their stories, learn from others and increase the presence and importance of these not-to-be-ignored issues. A small group doing much with little, their mission and actions are truly motivational. From their writing below, you’ll see what intelligent and committed women they are and learn how their creativity is fuelling and captivating their central mission. In their piece below, they share with us their personal narratives of how they began interviews from the field, and the impetus and practice that keeps them moving ever forward in their important work. 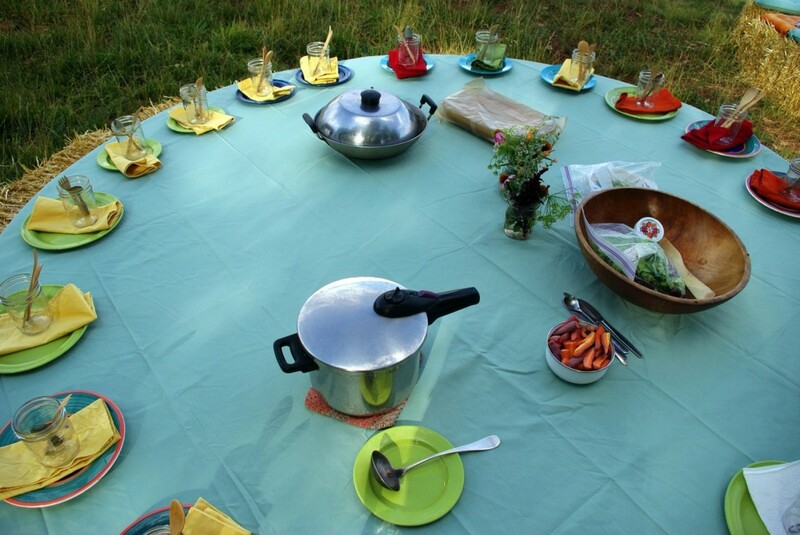 Seed Broadcast was initiated by Jeanette Hart-Mann and Chrissie Orr, at the Compartiendo Semillas, Sembrando el Futuro, Seed Exchange, in Las Vegas, New Mexico, in 2011, to investigate food culture in action. 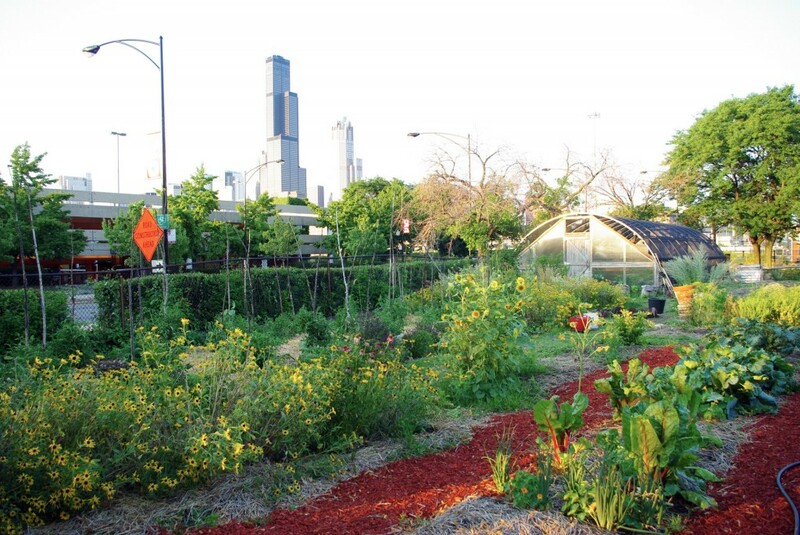 Exploring open pollinated seed networks, the ecology of urban and rural agricultural systems, and the meshwork of environmental concerns permeating food production today, this discursive project has become a testing ground for creative broadcasting and collective action. Engagement has included community based projects, installations, dialogues, creative actions, and experiential practices. Interdisciplinary collaboration is a founding principal of this project, where participants from diverse backgrounds work together as critical partners of inquiry, exploration, and creation. 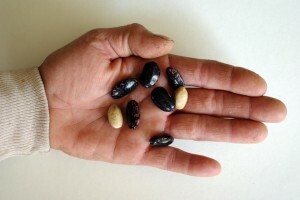 Interviews in the Field, Cathy Kahn’s Scarlet Runner Beans, Romeroville, NM, May, 2011. The first time I met Jeanette, it was at my local coffee shop where we talked and exchanged ideas for hours. It was easy and challenging and dynamic, we spoke the same language, we could agree to disagree. Two artists critically looking to new practices, both with a love and commitment to the potential held in each and every seed and in each and every community. This was the beginning. The process of collaboration and commitment to collectivity is a critical formation of SeedBroadcast. Like the ecological body of diversity and heterogeneity, it does not necessitate that we give up our subjectivity, but rather recognizes that agency is integrally connected to the work, passions, desires, and biological processes enveloping all of us. Seeds, pollination, adaptability, struggle, and action are the rhizomes of this process. Mobile Seed Story Broadcasting Station visits the Hull-­‐House Urban Farm, Chicago, Illinois, July 2012. What we call knowledge is not static. It is not trickle down service from those that know to those that don’t. Instead, it is a growing complex of local beliefs and practices that are shared, applied, and persistently transformed. To be a grower of food and a saver of seed, is to engage this directly. It is to be an active cultivator of knowledge and of what we call culture. This notion of culture is essential to our collective re-creation of a popular agri-culture and the most basic human right to grow, eat, and share the healthiest food around. This is the emphatic mission of SeedBroadcast. We started where we were called, the community of Las Vegas, New Mexico where there is a tradition of local growing practices in the rural areas around this former railroad town. We visited people in their own backyard gardens, in their farms and in their dried dusty garden beds that were left bare due to the city water shortage. We shared food together in fields and community centers, we made a “How to” book and we listened to one and other. These collaborators helped to shape and mold our initial ideas for gathering and dispersing local land-based stories in to what is now the Mobile Seed Story Broadcasting Station and networking practice. We were inspired by the people we encountered who invited us to share a day in their lives who shared their beliefs in growing and owning the rights to their own seeds and food production, the struggles to do this and the tenacity to continue. The relationships we built informed our structure and inspired us to dedicate our creative capacities to push beyond our notions of “art” to explore creative ways to encourage and broadcast critical dialogues around reclaiming our seed and food sovereignty. This is what we heard. Folks from all walks of life have shared Seed Stories with us. These are usually audio recordings with corresponding photographs of seeds, gardens, or portraits: beautiful, powerful, critical, and personal stories. Yet, we also recognize, encourage, and support other forms of expressions. These stories are shared as drawings, writings, conversations, documents, objects, and always seeds. This expressive diversity broadens our capacity for listening and teaches us about the possibility of a seed, of people, and of passions. It re-formulates power in the hands and minds of people sharing these Seed Stories and produces a new site for the articulation of sovereign agri-culture. 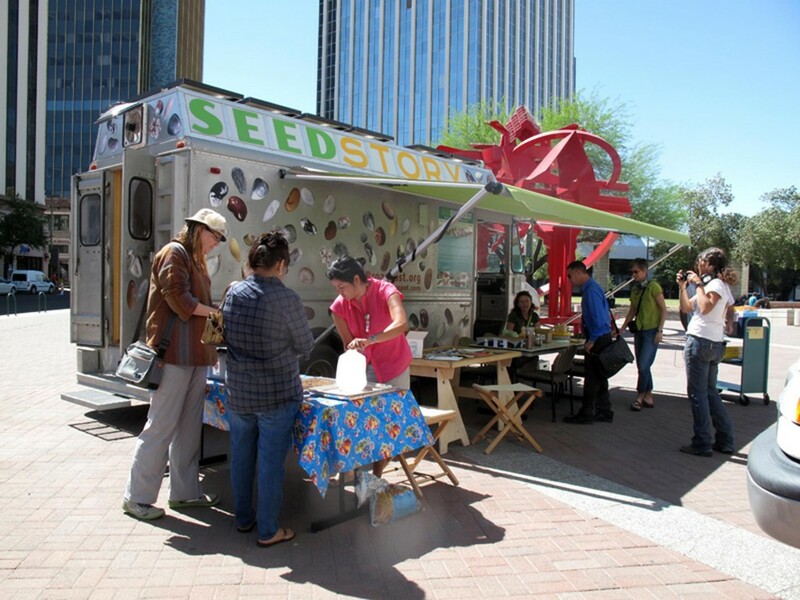 County Seed Libraries, Tucson, AZ, April 2013. Dedication and optimism go hand in hand. With all the challenges we face on a daily basis: lack of healthy food, water, land, seeds; a changing climate, and the corporate accumulation of wealth, power, and resources, who wouldn’t want to plant seeds, save seeds, and share seeds? Gardeners, farmers, seed savers, and people everywhere are inspired to play their part, beginning and continuing a long tradition to be infinitely optimistic and plant a seed. We followed our dreams. Jeanette dedicated her summer to create the Mobile Seed Story Broadcasting Station in an old bread truck as part of her Masters in Fine Art. She travelled slowly across county from Anton Chico, New Mexico to Vermont forming partnerships and connections along the way with seed libraries, seed lovers and local food growers who shared their wisdom and stories. The Seed Story dispersal and national networking emerged into many new seed loving friends, the seedbroadcast blog and web site. I remained at home in New Mexico, actively researching and pursuing grant opportunities, (thank you Kindle) and keeping up with our local partners and collaborators. 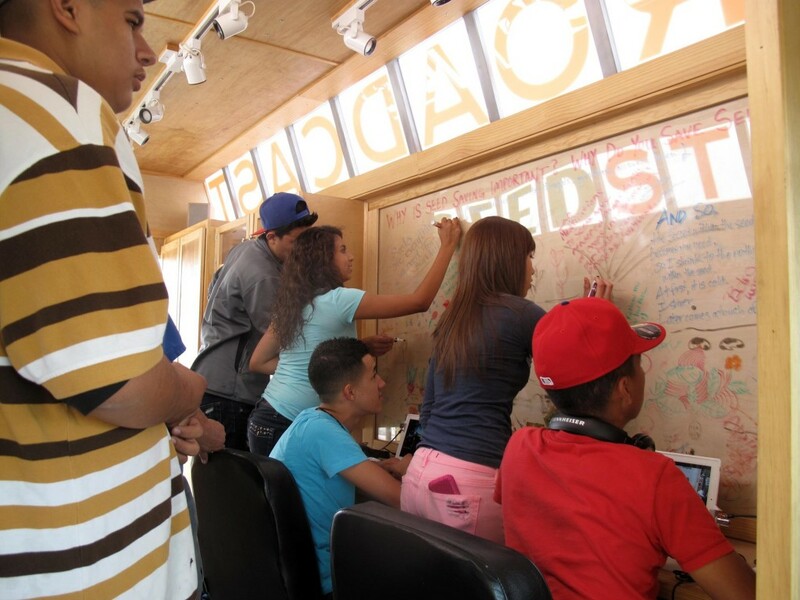 Students from South Valley Academy, share ideas and drawings inside the Mobile Seed Story Broadcasting Station. Albuquerque, NM, Sept 2012. Our conversations started that day in the café in 2011 and I believe that the time was right. Look at us now, we have just come back from a tour of the Southwest with local visits to Anton Chico, Santa Fe, Albuquerque Bio park, Native Seeds / SEARCH, to events and seed exchanges, to schools and rural villages and to the heart of urban Phoenix. The seeds bring us together in ways that I would never have imagined. They bring the young and the wise, the experts and the beginners but all who shared their stories with us have a connection to the potential that the seed holds. In these up side down times the seed holds the potential of HOPE, new growth, nourishment and wonder. This is what we are all looking for, is it not? What else will these seeds share if I listen to their stories? As this story accumulates, it moves us to believe that every seed and every seed saver, and every grower and lover of food, have crucial stories to share. This wealth of local, practical, and creative know-how is a site of unconditional knowledge building and the frontier of truly innovative people based, food practice.